Our home is filled with Playtex products. From the Ventaire bottles, the Diaper Genie, Pacifiers to toddler meal time essentials we have relied on Playtex for safe, dependable and high quality products. As part of the Online Baby Shower Giveaway event, I am thrilled to help bring you this amazing Playtex giveaway. 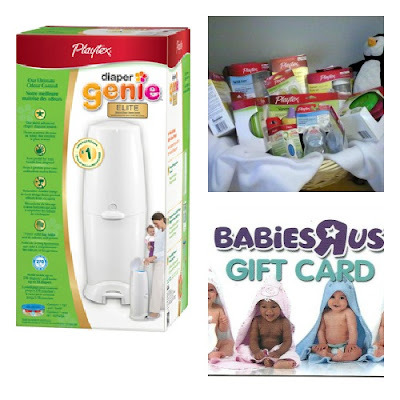 One lucky reader will win a gift basket full of Playtex essentials, a Diaper Genie Elite and a $100 Babies R Us gift card! Be sure to stop by Playtex Mommyville if you haven’t already and check out the full line of Playtex products and join the community for contests, coupons, helpful advice and more! A big thank you to KidSumers for organizing this event! This contest is open to Canadian residents. Contest closes August 24th. Motor Skills. Dangle objects over your baby as he lies on the floor so that he can swat at them. Reaching and grasping at objects, such as the rattle, helps develop motor skills.2 As babies gain more control over their movements, they'll interact more and more with their surroundings through play. Mommyville has a monthly sweepstakes for members where you can win a Sony digital camcorder, a diaper genie and more! Such a fun giveaway!Drop by nichollvincent.blogspot.com and say hello! Have a great day! This is so helpful for baby porrfing your home.One tactic often advised is to start by getting down on your hands and knees in order to see your home as your baby will. playtex mommyville is a fabulous site for any articles and tips relating to baby! I thought this was some very interesting information!Every baby is unique and your newborn has his own very recognizable cry that helps you to differentiate your baby’s sound from that of other crying babies, but at the root of each cry is a shared baby language. Researchers generally agree that within this language, the most used vocabulary is that of the howl, the whine, the wail, the whimper, the rhythmic sob and the rhythmic cry. What amazing recipes. I am going to try their First_chicken_casserole this weekend.